This month, we are sharing projects created with products from Stampin' Up! 's Holiday Catalog that was released today! I am so excited to see what all of my fellow blogging friends choose to use! The Holiday Catalog is full of beautiful new items! My wish list is loooong! But, I chose my absolute favorites to preorder and that is what I used to create the card I'm sharing with you today. As soon as I saw the stamp set, Every Good Wish, I was in love! 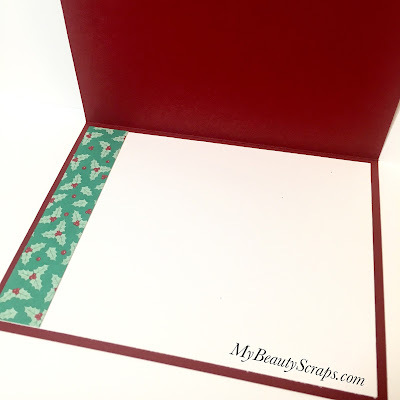 It has bold sentiments which I love because they make a card come together so quickly & easily! And, the sentiments are beautiful! They give you that watercolor emboss resist look with a simple stamp! 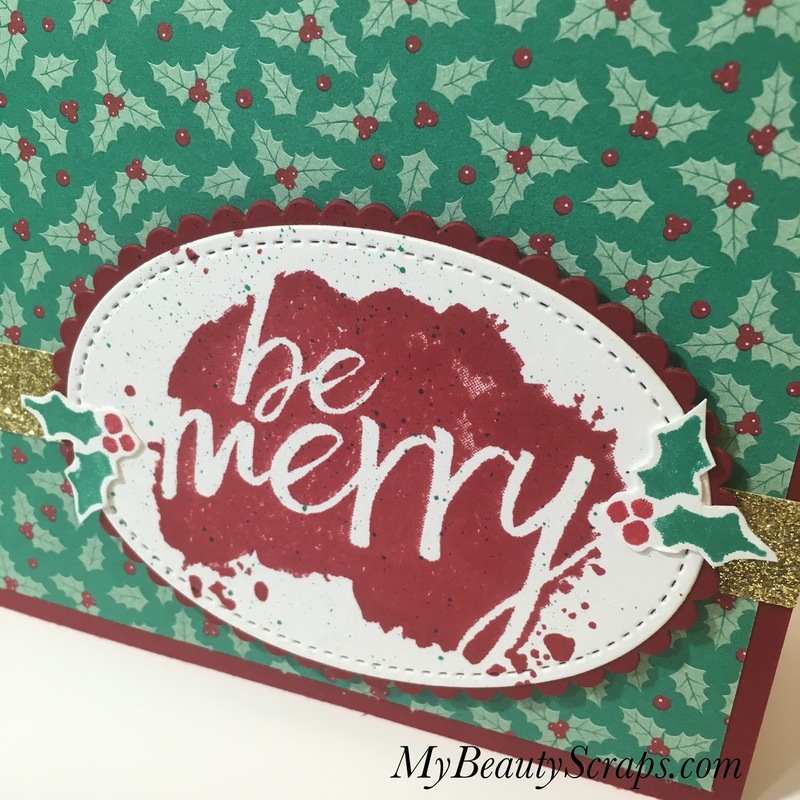 With all of the new items in the holiday catalog just begging to find a new home in my craft room, I'm trying to use up some of my papers from last Christmas to make room. This gorgeous holly paper is from last year's Presents and Pinecones Designer Series Paper Pack and lucky for you it is currently on the clearance rack in my online store :) The holly pattern is super cute with the holly stamp in this set. And, you guys know that I hate to waste any of my gorgeous Designer Series Papers, so I used the little strips that were leftover after cutting the 4 x 5 1/4" panel for my card front to decorate the inside. Another great way to use your scraps? Give them to your kids! My son Peter loves to make projects with "Mommy's toys." I gave him a card base, some paper scraps and an extra stamped sentiment and he went crazy with the glue, lol. He was so proud of himself! It was adorable! And, his card came out really cute, too! Thanks for stopping by my blog today! I hope you enjoyed the card idea. I would love it if you would leave me a comment to let me know what you think. And, please Contact Me with any questions you have! I'm always happy to help! Next up on the Blog Hop is Jessica! Click the image below to continue along on the hop for many more beautiful creations made with our favorite items from Stampin' Up! 's 2017 Holiday Catalog! Danica - your son is adorable! 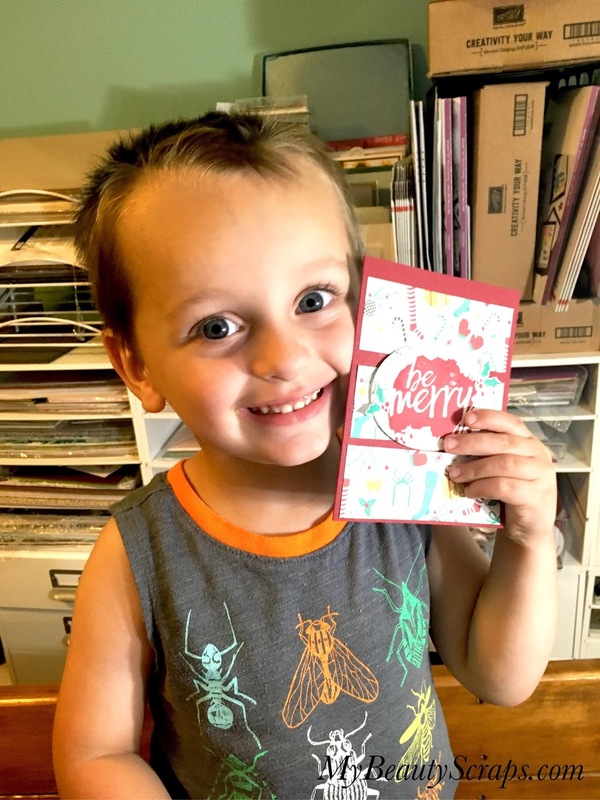 He looks so proud of his card. Start them young so they turn into helpers in a few years. WINK WINK!! The large sentiment is a great focal point on DSP. I love seeing cards made with the stuff I didn't buy yet and this is a great card! I was kind of curious how one might use this stamp set. Aw, "everything great" but, your son and his own creation, is precious and wonderful! TFS!